Optical illusions form an important part of our lives; without them many road signs would be less effective; style, fashion and decor would be nowhere and M C Escher would be nobody. Yet most light-and-sight books relegate them to space-filler status, so a whole book of good examples is an unaccustomed luxury. This title is a rar? serious look at how eyes and brain cooperate and how they conspire to help us make assumptions that deceive our perceptions. 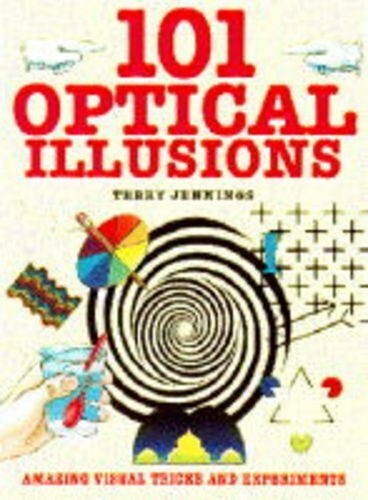 Jennings presents three groups of illusions. 'On sight' emphasises our optical limits as we see non-existent colours, phantom figures and holes in the hand. 'On perception' illustrates our cerebral limits - one mind may create an image which other minds may not interpret the same way, thereby believing the impossible - everlasting stairs, eightlegged elephants etc. Jennings explains that the perception depends on the perceiver and there is no one 'correct' way of interpreting the examples shown. 'On movement' deals with persistent vision and how it helps flick books and how zoe-and thauma-tropes, strobo- and phenakisto-scopes work. There are good instructions for making these too (without cutting up the book!). Pang's illustrations deserves a mention, for the examples are all clearly and accurately realised and, to my eyes at least, achieve their aims entirely - or they appear to! An entertainingly serious look at a subject which, although often seen as frivolous, is actually highly influential.